Home | Practice Areas | Social Security | Does an Attorney Improve the Chances of Winning Disability? If you have a disability or an illness that prevents you from working, and you want to apply for Social Security Disability Insurance (SSDI) benefits or Supplemental Security Income (SSI) benefits, hiring an attorney to help you with your application or your appeal of a denial greatly enhances your chances of successfully gaining benefits. A study by the U.S. Government Accountability Office (GAO) shows that people who hired an attorney to help them with their disability benefits cases were three times more likely to be successful than people who did not. When you should hire an attorney, however, depends upon your situation and how far along you are in the process of applying for SSDI or SSI benefits. What Are the Differences Between SSDI Benefits and SSI Benefits? Once You Have Applied for SSDI or SSI Benefits, How Does the SSA Determine If You Are Eligible? Does Having an Attorney Improve Your Chances of Winning a Disability Case? When Is the Right Time in the Application Process to Hire an Attorney? You need to have worked in a job where you paid taxes for Social Security. In 2018, you need to have obtained 40 work credits in total and 20 over the last 10 years. In 2018, you gained one work credit for every $1,320 you earned from wages or income from self-employment. There are also special conditions for younger disabled individuals who may not have had time to obtain the necessary work credits. You need to prove that your disability or your illness has prevented you from working for either the past 12 months or will prevent you from working for 12 months or longer. You also need to prove that you are not meeting the Substantial Gainful Activity (SGA) of income per month. In 2018, that was $1,180. In 2019, it will be $1,220. If you are earning more than that amount in a month, even if you have a disability, you are not eligible for SSDI benefits. No SSDI benefits are paid for partial disabilities or disabilities that last less than 12 months. SSI benefits are paid out of general tax revenue and not out of Social Security taxes. They are designed to help individuals with a disability who have limited or no income and who have no assets above a certain level. To be considered disabled for SSI benefits, you must meet the same conditions as SSDI benefits — you have not been able to work for the last 12 months or will be unable to work for the next 12 months or longer. SSI benefits provide cash to meet basic needs like food, clothing and housing. You can earn up to $750 a month on SSI benefits as an individual and up to $1,125 as a couple, but funds will be subtracted from your benefits if they meet the SSI definition of income. So if you were earning $200 a month in income as an individual, that amount would be subtracted from the $750 benefit total, and you would receive $550 in SSI benefits. If you are eligible for SSI benefits, you may also be eligible for SSDI benefits. If you think you qualify for both benefits, this is an ideal situation where an attorney can help you determine how to proceed. You will continue to receive both SSDI benefits and SSI benefits as long as you are disabled. Depending upon the nature of your disability or illness, you will undergo a Continuing Disability Review (CDR) roughly every three to five years to determine if you are still disabled. There are several levels when you apply for SSDI or SSI benefits. The first stage is to make your initial application. Whether you do it in person, on the phone or online, your application will be given a quick review to determine if you are eligible based on age or income. For instance, if you are over 65, you cannot apply for SSDI benefits or SSI benefits, but you can apply for Social Security retirement benefits. If you are making more than the SGA, your application will also be denied. This is known as a technical denial and ends your application immediately. If your application passes this first review, it will be given to an examiner at a local federally funded state agency known as Disability Determination Services (DDS). This examiner will take into account all the relevant information, particularly your medical information, in making an initial decision about your application. If this DDS examiner denies your application — and roughly 70 of initial applications are denied according to SSA figures for 2001 through 2010 — your next step is to file a reconsideration appeal. In this case, your file will be given to a new examiner to review. It is, however, doubtful that your application will be approved during a reconsideration appeal if it was initially denied. Once you have received the notice of a denial of a reconsideration appeal, you have 60 days to request a hearing with an Administrative Law Judge (ALJ). During an ALJ hearing, you can present new medical information and even call witnesses who can validate your claims of being disabled. This is the level where applicants have the highest success level with almost 62 percent of those who have requested a hearing with an ALJ successfully overturning their initial denial. If the ALJ again denies your claim, your next step is then to file for a review with the Appeals Council. Finally, if the Appeals Council still denies your application, you can file a lawsuit with the federal court. You should note, however, that at this final stage of the appeals process, you are required to start paying court fees to file your suit. Up until this point in time, you have not had to pay a penny for any of the previous levels of appeal. An attorney understands your rights and knows how to persuasively argue for the benefits you deserve after your injury. They can cite the exact rules and laws which may be relevant to your case. Missing a deadline in a Social Security disability claim can lead to an automatic denial. Attorneys understand the deadlines involved and can work to submit your application and appeals well before the final date. It can be intimidating contacting the Social Security office or testifying before a judge at a hearing. An attorney can take care of many of these details for you. Your attorney knows what to say to strengthen your case and can be a powerful voice for you. Sometimes seemingly minor pieces of evidence or innocuous statements mean the difference between a successful disability benefits claim and a denial. In many cases, people do not feel they need to hire an attorney to help them with the application process until they reach the third level — requesting a hearing before an ALJ. 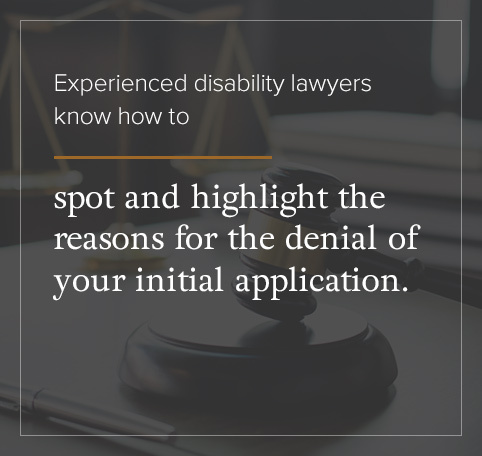 You may or may not need the help of a disability attorney during your initial application process, or even during the next phase, the reconsideration appeal. These stages mostly require completing necessary paperwork and going to medical appointments if the SSA believes it is necessary for them to decide your application. This does not mean, however, that asking an attorney to help you through this unusual process is a bad idea. Experienced attorneys can help you win your case at the application level — remember 30 percent of cases are still approved at the initial level — or during the next reconsideration phase. In these cases, the attorneys can help you gather the evidence that you need to establish the severity of your condition, which plays a key role in the SSA determining your eligibility. This is especially the case when the SSA initial reviewer is looking at whether your condition prevents you from meeting the SGA level. Experience disability lawyers know how to spot and highlight the reasons for the denial of your initial application. Were you earning too much money? Did you not provide enough medical evidence? Did you make mistakes on the initial application or fail to fill out essential sections? As they go through this process, experienced attorneys can find those errors. Occasionally, when they discover these errors in your initial denial, your attorney will request an on-the-record decision from the ALJ. The ALJ may grant you your benefits in this type of bench decision when your attorney can show the ALJ that it is pretty obvious that your claim is a good one and should be approved. In these cases, your attorney can dramatically shorten the amount of time between your application for benefits and when you are approved for benefits. This is critical when you consider that the waiting period for an ALJ hearing can be between 12 and 18 months. Many applications for SSDI benefits or SSI benefits are denied because they do not have enough medical evidence to prove your disability claim. One of the main jobs of your attorney while preparing for the hearing with the ALJ is to gather all this necessary documentation. This will include details on limitations and restrictions, lab results, treatment plans, examination notes, prescription drugs, notes your doctor has made on your case and other relevant information. If you are still dealing with the effects of your disability, this can limit your ability to gather this information in the appropriate time, and your attorney can perform this valuable task for you. Even if you do not hire an attorney for the first two phases of the application process, it is a great idea to keep a daily journal of just how you feel your disability is limiting your ability to work. Your attorney can use these notes from your journal during a hearing with the ALJ to add further evidence of your claim’s validity. Solid documentation is without a doubt the most critical factor in successful SSDI benefits or SSI benefits applications. An experienced Social Security disability lawyer has access to many resources that can help you win your case. They know about the laws concerning SSDI and SSI benefits, they know medical tools that can help prove your claim, and they have studied past Social Security rulings that may bear upon your case. Your attorney supports you through this entire process, but this is particularly true at the ALJ hearing. Acting as your representative, your lawyer can submit your evidence including any new medical information that has a direct bearing on your claim. They can also advise you whether you should include any witnesses that your hearing who can support your story, and they can question you about your disability which allows you to tell your story in your own words. If there are any medical doctors or vocational experts in attendance, they can ask them questions about your case. Your attorney understands what medical and legal evidence is required by the ALJ to grant your appeal. They know the right questions to ask and the most critical documents to discuss. Experienced attorneys also have a feel for the kind of evidence that certain ALJ judges require, especially if they have appeared in front of them in previous cases. There is another good reason to hire an attorney to help you during this appeal stage. If you represent yourself, and you have gone through the entire process of gathering documentation, preparing witnesses and then arguing your case in front of the judge, the judge may wonder why you can deal with all of the legwork that is required to deal with the Social Security appeal at this level but you say you cannot work. Not every judge may respond this way, but it is a factor to consider. The bottom line is that you greatly enhance your chances of winning your SSDI or SSI benefits application when you work with an experienced disability lawyer. Also, attorneys work on a contingency fee when handling disability cases. This means they do not get paid a cent unless you get paid. The federal government determines attorneys fees for disability cases. For their work on your SSDI or SSI benefit appeal, attorney fees are capped at $6,000 or 25 percent of the back pay you would receive during an appeal, whichever total is lower. As you can see, hiring an attorney to work with you makes sense in terms of improving your chances of winning your application and financially as well. If you are concerned about your disability benefits application or have been denied, contact the attorneys at KBG Injury Law for a free consultation. We treat each client as an individual and give each case the attention and effort it deserves. You can call us at 1-800-509-1011 or visit our contact us page where you can leave us your contact information and some details about your case.